Four bestselling authors. One hellraising premise. What if the dead could be summoned from their graves — for a price? What if a quartet of distinctive storytellers took a stab at this deceptively simple idea — on a dare? 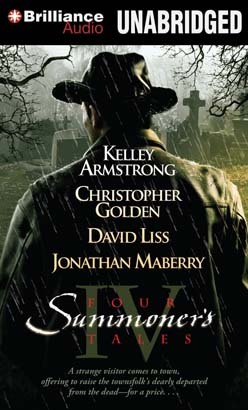 The answers lie here, in Four Summoner’s Tales, as these acclaimed writers accept the challenge and rise to the occasion — in four brilliantly chilling ways. It’s all in the execution. . . . “SUFFER THE CHILDREN” BY KELLEY ARMSTRONG #1 New York Times bestselling author A preacher and his adopted daughter must solve the mystery of the newcomers to their isolated 19th-century village — men who are preying on residents’ overwhelming grief with promises to bring the stricken back to life. “PIPERS” BY CHRISTOPHER GOLDEN New York Times bestselling author Twenty-three people have already lost their lives to the ruthless cartel terrorizing their small Texas border town. But one man has a plan for revenge, if the town’s survivors will let him use their loved ones — to raise an army of the undead. “A BAD SEASON FOR NECROMANCY” BY DAVID LISS National bestselling author In merry old England, a rascally con man stumbles upon a book for raising the dead. But instead of using it to make money reviving relatives for the rich, he’ll do just the opposite. Because some family skeletons need to stay buried. “ALIVE DAY” BY JONATHAN MABERRY New York Times bestselling author In war-torn Afghanistan, a U.S. military operative and his team face off against an ancient horror during a harrowing off-the-books search-and-rescue mission.